In My PrivateUniverse: cool beans! well i've had an exciting couple of weeks! new project at work is coming together - should be all go on the research project soon, with the chance of being involved in another one a few months later. had a weekend of cyber crops- i got so much done, and used up so much stash it's crazy! I've won a set of Autumn leaves stamps from here so big thanks to the very lovely Lou... brilliant shop, fantastic service, and really great items that you don't find everywhere. can't wait for them to arrive and me to have a play with them. been buying xmas pressies, and wrapping them this weekend. Still don't feel too xmassy, but am enjoying getting things together, and looking forward to a break. finally got our holiday to orlando sorted. still searching for hotels or b&b's in chicago. 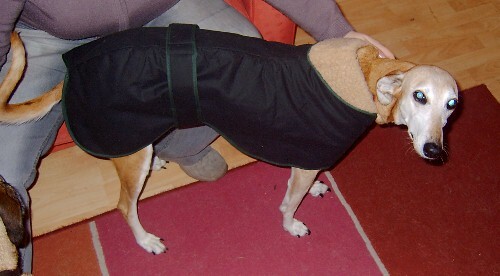 finally got Peg Peg a winter coat. she seems to love it, and could quite happily sleep in it! on the home front i've made some rather yummy (even if i do say so myself!) beetroot relish. it took forever to thicken, but it's scrummy with cheese! Decided not to make christmas cake or pudding this year. it's only Dh and me, and it seems to be a waste if i make a huge cake just so that we can stuff ourselves. Might treat ourselves to a nice small one.But none of that fake icing! The girls at work are finding it quite amusing that i have a picture of him on my desktop - it's normally a cute dog or something! righto, off to write some crimble cards! Sounds like youve been busy! Sorry, was logged in as hubby!